Africa now has the unique web address, .africa, following its official launch by the African Union on Friday, 10 March 2017. The AU commission chairperson, Nkosazana Dlamini Zuma, noted that with .africa, Africa has finally got its own digital identity. The AU went ahead to say that the .africa domain will “bring the continent together as an internet community”. ICANN, the body that establishes these addresses known as generic Top-Level Domains, approved the move, after lobbying by the AU. The campaign was spearheaded by a South African company, ZA Central Registry (ZACR), which will now be responsible for registering .africa names. ZACR’s CEO, Lucky Masilela said that .africa addresses could cost as little as $18, and will be available as from July. There are more than 300 million domain names in use currently, with the most popular, .com, having 125.8 million registered domains, according to the Council of European National Top-Level Domain Registries (CENTR), a European body monitoring domain names. “.africa is going to be a market disruptor and will assist in lowering the cost of domain names,” said Lucky Masilela, CEO ZA Central Registry in an interview. 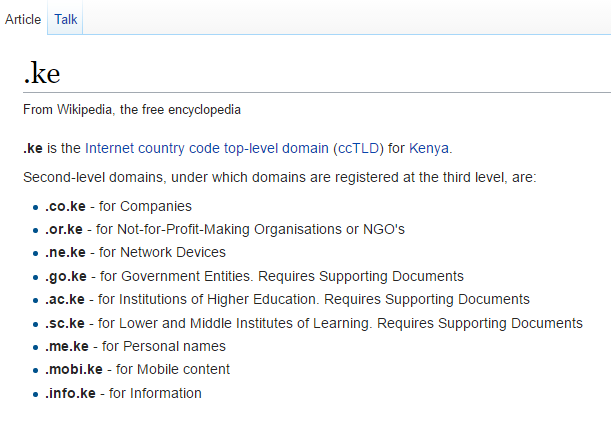 African countries already have their own individual domains, such as .KE for Kenya, .NG for Nigeria and .ZA for South Africa. The new .africa domain will provide an option for continental-wide sites, akin to the .eu domain in Europe. Other domain names recently created by Icann, include .fun, .phone and .hair.